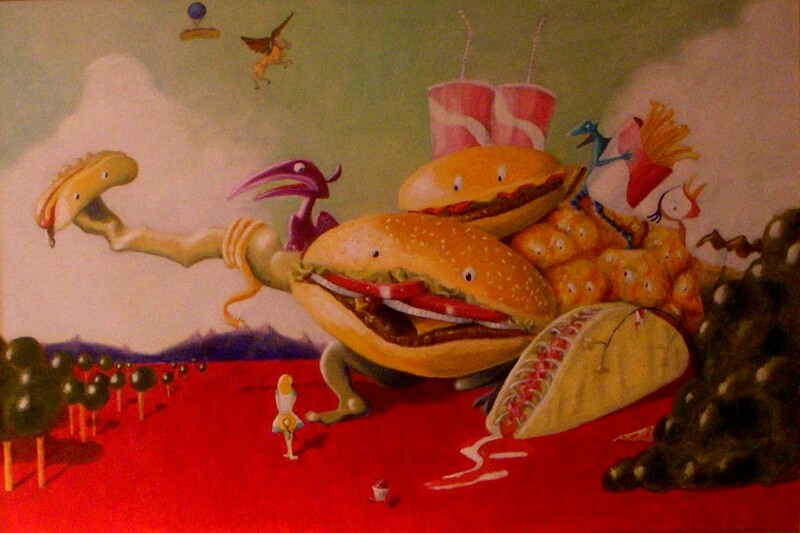 “The Temptations of Fast Food.” Oil on canvas. Circa 2000. I think the best moment for me would be right before removing the sandwich from its waxed paper wrapping. I’ll be sitting at the table, carefully arranging the fries and the drink on the tray on either side of the colourfully enfolded sandwich, maybe reading the fun facts and the ad copy on the paper placemat, full of benign indulgence -no, to be honest it’s really an almost poetic appreciation for the artfully arranged sequences of adjectives, unfallibly calibrated so as set my mouth a-watering: “melted,” “old-fashioned,” “premium,” “zesty,” “hickory-smoked,” “baconated.” The words seem to combine with the colours of the accompanying photograph and the wrapper, the smell of the fries, and the memory of the television ad to conjure up a sense of irresistible anticipation. The promise of a perfect interlude of ingestive bliss is laid out before me, so close that, as with Gatsby’s dream by the green light of Daisy’s dock, I can “hardly fail to grasp it.” I finish unwrapping the sandwich and grasp it firmly with both hands, the way they do in the commercials. Unlike the photographs on the placemat and on the walls, I give the actual unwrapped sandwich only a cursory glance before raising it to my mouth. But it is enough for that exultant feeling to have begun to dissipate a little, even before the taking of that ritual first bite: The contrast between the slightly soggy, slightly flattened aspect of the bun especially has struck too dissonant a note with the vision of the sandwich’s platonic ideal that had beckoned so alluringly from the menu board. And then I’m sinking my teeth into that squishy bun, I’m swallowing that first morsel… and it’s pretty much all over. The sense of elation is gone. Was the taste that much of a disappointment? Not really, I suppose. I guess it tasted pretty much as I had expected it to. I’ve eaten here many times, after all. Of course I always remember it as better than it is (why else would I come back? ), but is that really the problem? Even if the sandwich tasted as utterly fantabulous as it looks in the pictures, would it be worth getting that excited over? For the sake of a certain taste on my tongue, a certain texture against the inside of my mouth? What was that feeling of enraptured anticipation all about, really? Anyway, it’s gone now. This entry was posted in painting and tagged fast food, great gatsby, hamburger, hieronymus bosch, painting, surrealism, temptations. Bookmark the permalink.